The Pocono Mountains are home to three canids that are among the most beautiful and charismatic predators in North America. Let’s learn about our “dogs of the Poconos”. Foxes are the smallest of our canids, and there are two quite different species in the northeast. Both foxes are intelligent, quick and have exceptional sense of smell, hearing and eyesight. Crepuscular and nocturnal, they prefer to hunt from dusk till dawn. The Gray fox is the smaller of the two species, weighing 7-13 pounds. Although they do have red ON them, they are darker and smaller than the larger red fox. Gray foxes are grizzled gray with a black streak running down the tail. Because they live in the woods, Gray foxes can do something no other wild canid does- climb trees. Red foxes weigh in at 8-15 pounds, and are about 2 feet long, plus their bushy white-tipped tail, with stunning reddish-orange fur. They have black ears, legs and feet. Red foxes prefer more open habitats than Grays - fields, edges, farms and even suburbia. Both foxes are omnivores. They will catch and eat rodents of all kinds, rabbits, snakes, insects, birds and eggs, plus fruits, grains and grasses. Foxes have acute senses of hearing, sight AND smell, and they use these to avoid predators, which include people, Great-horned owls and coyotes. When hunting, much like dogs, the Gray fox pursues prey by chasing and pouncing. Famous for their catlike high jump pounce, sometimes landing deep into the snow, there is more to Red fox hunting behavior than was previously known. When the fox aligns himself facing northeast the pounce is successful in catching prey more often than facing in other directions. Some birds, turtles, bats and sharks use magnetic fields to navigate, but not much is known about how they do this. Male foxes are called “dogs” and females, “vixens”. Fox babies are called “kits”. Breeding season is in February. Foxes bark, or more accurately in my experience, scream during this time. They den in old groundhog holes and other excavation dens, under foundations of barns and sheds, and under logs. Gray foxes also select excavation dens, but prefer to den away from people. Litters of 4-8 kits are born during April usually, and weigh about 8 ounces each. Kits’ eyes are closed for just over a week and they leave the den when they reach 5-6 weeks. Fox kits, especially Reds, are seen playing and “practice hunting” during the day. They practice pouncing, catching insects, and then catch mice as they become more adept. Kits are able to survive on their own in August or September. Unlike most mammals, dad plays a major role in caring for the nursing vixen and feeding and protecting the pups when they leave the den. The smallest canids of the Poconos provide excellent watching opportunities and help control rodent populations. The eastern coyote is the second largest predator in Pennsylvania. Our coyotes are not only different from western coyotes; they aren’t even pure coyote… PBS Nature Watch the full episode calls the eastern coyote the “coywolf” because both eastern and red wolf DNA is a significant part of our coyote’s genetic makeup. Eastern coyotes are larger than their western counterparts. They don’t have that “foxy” look and weigh 30-50+ pounds, a good 10-15 pounds more than western coyotes. They do vary in color ranging from golden to gray. They live in small family groups or singly. Mating season is during the winter; pregnancy lasts two months and three to eight pups are born during April. Both mom and dad feed and protect the pups which stay with them for several months to a year or more. During the weaning process, dad and older siblings provide regurgitated food to the pups. The purpose for this is not just easy digestion, but it also provides a clean and nearly odor-free den site. Coyotes maintain a rendezvous site, kind of like the place your family meets when finished shopping at the mall. Sometimes people unknowingly come upon such sites or den sites while walking their dog and may be followed by a coyote. The coyote is ushering you and your pet from its site as a way of protecting its pups. Coyotes are valuable to the Pocono ecosystem. They eat a wide variety of prey which includes mice, voles, squirrels, rabbits, turkeys and some deer. We receive many calls during the winter about injured deer. The weak, injured and young are prime prey. Feral cats and foxes are also considered prey for coyotes. No verified attacks on people have been made by coyotes. Unlike western coyotes, they are quite shy. We have treated several coyotes that have been injured. Read about one coyote’s journey through his injury, rescue, surgery and release back to the wild at Pocono Wildlife Rehabilitation and Education Center in a coming issue…. If you’ve ever wondered about how our coyotes compare with true wolves, I recommend visiting Lakota Wolf Preserve in Columbia NJ, a short drive from Delaware Water Gap. Visit www.lakotawolf.com for more information. 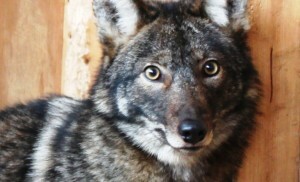 Lakota is not a zoo, but an educational preserve where you can see and learn about several kinds of wolves including timber, tundra and Arctic wolves and learn what makes wolves unique and vital to the ecosystems in which they live. They also have bobcats and foxes, to round out an excellent predator education experience.